I decided to make shrimp for dinner but didn't want the same old scampi. So, I looked in my fridge and pulled these out and was inspired. 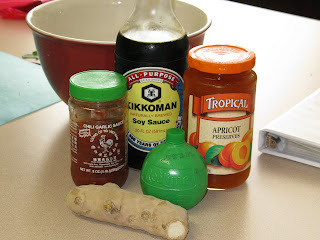 Mix Chinese chili paste, soy sauce, apricot preserves, fresh ginger, and lime juice (yes, I used the store bought - don't judge, I just got back from a trip). Mix these up. To help the mixing, heat the preserves up in the microwave for about 30 seconds. Peel, devein, and rinse your shrimp. Please, do not use precooked shrimp. Mix the shrimp in the marinade. Now, test the shrimp to make sure you like the seasoning. I take one out of the marinade, and drop on the grill pan. Adjust the mixture as needed. Fry up for a couple minutes on both sides until pink skin and opaque meat. oh man, I love anything with an asian flare...that looks so tasty, I bet they would be great grilled too!